At Capital Cycle Camp, kids explore the city on two wheels, biking to museums, parks, and service projects. Photograph courtesy of Capital Cycle Camp. Forget popsicle crafts and canoeing. Letting your kids roam city streets—with supervision, of course—is the new summer camp. Let’s call them urban camps. But by that we don’t mean camps that just happen to be within city limits. Rather, these are programs that, instead of hosting kids at a specific site, take them out to enjoy and learn from all the free and accessible resources Washington has to offer. Your children can spend the summer exploring local parks, museums, and businesses, plus participating in community projects—while riding Metro and getting to know their city in a new way. The following are a few day camps whose boundaries are limited only by the hours of the day and the ends of the Metro lines. Each blends outdoor education, community immersion, and fun. This is summer on wheels—two, to be exact. Kids pedal from activity to activity throughout DC. 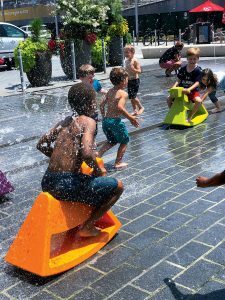 A week might include biking around the Mall, visiting the Smithsonian Folklife Festival, watching planes at Gravelly Point, climbing through the summer exhibit at the National Building Museum, or working on community-service projects. The camp has been run for the past six years by Ben Berkow, a former DC Public Schools teacher who recently started working as a research analyst in information systems focused on education. Cycling is merely the mode of transportation, but kids do learn how to fix and maintain their bikes. Campers range from first grade through middle school and need to be proficient at riding a two-wheeled bicycle without training wheels. In any given week, 16 to 30 kids are in the program, with a camper/staff ratio of six to one. The day starts and ends at a church in the Capitol Hill neighborhood. The camp works with churches and nonprofits on service projects, which have included volunteering at a food pantry and helping with anti-erosion efforts along the Anacostia River. Among the other activities are visits to libraries, pools, parks, and businesses—and there’s always a rainy-day plan. Middle-schoolers get an overnight excursion on the C&O Canal. While the activities are plentiful, Berkow doesn’t pack the schedule—there’s usually one activity in the morning and one in the afternoon. “I intentionally don’t overprogram,” he says. “When parents realize the simplicity, they appreciate it.” He also mixes up the activities each week, though some are popular enough that kids love going back. The camp runs from 9 to 6, a rarity and a blessing for working parents. If a child doesn’t own a bike, Berkow can loan one. For more information, click here. Cost for a five-day week: $430. Tony Hurst, a librarian at DC’s Beauvoir school, created his camp 13 years ago after he couldn’t find an educational, affordable city camp for his own child. That first summer, he had five campers over two weeks. Last year, 453 attended across seven weeks. Among the many outings at Mr. Tony’s Adventure Camp are spray parks. Photograph courtesy of Mr. Tony’s Adventure Staff. Mr. Tony’s camp takes kids on outings throughout the District. In a given week, the schedule incorporates two days in nature, two water-play days, and a day of culture. One day the kids might go to Capital Candy Jar to learn about making sweets, then head to a spray fountain at the Wharf. Another time, they’ll hike around the National Arboretum and take in a show at Discovery Theater. Destinations might also include Fort Dupont Park, Meridian Hill Park, Anacostia Park, the National Zoo, or the National Museum of the American Indian. Camp begins and ends at Miner Elementary School on Capitol Hill—the dropoff and pickup spot—before everyone sets off for the daily excursion via subway, bus, or foot. The camp accepts ages three through eight. Those nine and up can attend as counselors in training. Kids can participate for a single week or the entire summer—Hurst switches up activities to avoid repetition. For more information, click here. Cost for a five-day week: $250. What started as an educational option for kids and working parents when DCPS was closed for holidays or professional days has turned into a year-round outdoor urban program with a summer camp. Designed for first grade through middle school, Urban Adventure Squad partners with organizations in the District and nearby suburbs to come up with educational programming. Kids spend much of their days outdoors with a low emphasis on electronics, although sometimes technology is incorporated into the learning. A program with Temple Micah—dubbed “restaurant week”—focused on creating an eco-conscious eatery that minimized food waste and emphasized local ingredients. It included a guest educator on food waste; cooking projects; and a final pop-up restaurant challenge, as well as visits to the Macomb Recreation Center’s spray park and a hike to Tregaron Conservancy for a community cleanup. UAS also partners with Gallaudet University, Embassy Church, Mosaic Church, and Stokes School for programs where the camp is centralized for the week. Campers might ride public transportation to visit businesses, nonprofits, parks, and other destinations, and they bring their own brown-bag lunch each day. Programs focus on environmental science, architecture, theater arts, history, design, and more. UAS recently received a grant from the DC Department of Energy and Environment for a curriculum about the Anacostia River. For more information, click here. Cost for a five-day week: $335 ($268 for siblings) before March 1; $385 (and $310) after. One of DC’s best attractions, of course, is the Smithsonian, with its excellent free museums, but kids usually must rely on their parents’ availability to take them. However, at the Smithsonian Summer Camp, now in its 50th year, children can explore the museums at their own pace, with an educator beside them, for an entire week or more. The camp is designed for rising kindergartners through ninth-graders; ages 15 and up can be teaching assistants for the younger kids. Each of the weeklong programs has an age-appropriate theme. For example, the youngest campers can observe and record the “ABCs” of the Smithsonian by journeying through its museums and the National Zoo, while older kids might pursue a week of digital photography using the Smithsonian grounds as backdrops. Other programs focus on space travel; Native American history and culture; painting; TV production; and US history. Campers aren’t restricted to a single museum—they travel about the Mall with their group, each of which is about 16 to 21 kids with two instructors. Camp starts in mid-June and lasts through mid-August, with before- and after-care options. For more information, click here. Cost for a five-day week: $460 nonmembers; $395 members.